Brick and block cavity wall ties are on e of the most common types of constructional elements used on site. However, it is relatively easy to select the incorrect type of cavity wall tie or specify an insufficient number along a given length of brick wall. Another area where careful consideration is needed is around openings and here any anomalies in the detailing can lead to issues further down the live. 1. The horizontal and vertical spacing of wall ties may be varied if necessary to suit the construction provided the number of ties per unit are maintained. Cavity wall ties should be manufactured from stainless steel because of the materials superior strength and corrosion resistance. Avoid hooking wall ties together using masonry globs to keep insulation in place because it can lead to cold bridging and dampness. The remedial action for this can be extensive, including having to re-build the wall. It is often possible to detect where insulation has moved, which usually manifests itself with cold areas on the inner wall within the room, and this can lead to condensation and mould growth as well as excessive heat loss. Fortunately, there are simple and inexpensive solutions to this problem, such as our Insulation clips. This is a universal retaining clip that holds insulation in position, where it should be, against the inner leaf of a cavity wall. Use only insulation clips that are compatible with your wall tie, such as our SS/DTW Double Triangular Wall Tie. When cavity walls first began to be constructed around 100 years ago builders used ‘through stones’ instead of wall ties to maintain the cavity. However, this often lead to moisture tracking along these stones, either from the outside, or penetrating poor mortar joins and weeping down the inside of the outer leaf and across to the inner leaf. It also allowed cold bridging, with both resulting in damp areas on internal plastered walls exactly where the ‘through stone’ was located. It is still possible for moisture to travel along cavity wall ties, although you can avoid this by setting them so that they ‘fall’ outwards. It also worth choosing a wall tie with a double drip feature as this further prevents moisture travelling to the inner leaf, but always make sure that the ‘drip’ kink in the wall tie points downwards and is positioned near the centre of the cavity. CE marking doesn’t replace Building Regulations and so you still need to make sure your wall ties meet relevant standards. You should reduce the vertical spacing of wall ties around openings such as windows, doors, roof verges and movement joints to a maximum 300mm and placing them within 225mm of the opening. Effectively that means a wall tie every course of blocks within 225mm of the opening. 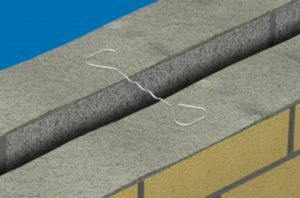 Cavity wall ties are an important element in ensuring the stability of your cavity walls. Our guidelines above will provide you with information on the correct selection, spacing and installation of wall ties. The above are for guidance only. Before choosing wall ties always refer to Approved Document A for more detail. For more information on our range of wall ties, visit: www.bpcfixings.com or call: 01924 364794. Previous Previous post: Why is demand for fencing, decking and gardening ranges from holiday parks increasing?